Other gears : AK lunakaligo/evil ears for cades, hide dring, frilldora, valk shield, morph shawl. I rarely if ever swap out ED for porc. I'm waiting a bit to see if GMs implement different bg foods (+8 str etc) before using my stat points. And I haven't woed on v3 yet, need to see if 85 total vit will be enough. - Motivations to play RO (What do you like in this mmorpg ?) Mostly WOE. Bg/pvp on ero sux. Mvps are only for gearing. - Do you know some guys from the guild here? Not yet. - What is the experience you have in the class you want to play? I've mained mostly crea, hw, prof for the last few years, but I know how to play champ. 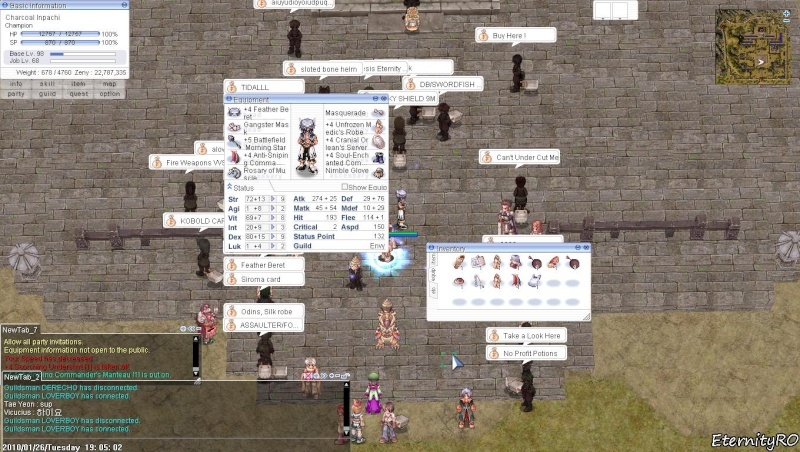 - Do you play other MMORPG's (+ time compared to RO)? Eve Online. I just log in 1 min per week to add skills to the training queue lol. - Old guilds (servers)? Ethereal RO, Euphro, Ero v2. I only did woe se in StrongHold though. - Availability for Woe? Should be 100%, except during examination period. I'll notify when I can't make it. - Weekly time you spend on getting mats for woe? I play a lot. - Types and quantities of used consumables ? ~3000 ranked blues, ~1000 slim whites, ~100 speed pots/bor/bog, ~20 str,dex,int,vit food, ~30 berries/seeds. - Explain (briefly) your role in a Woe? (SE - FE) Asura creas, profs, clowns. And cades/gs. On def, I'll probably just kill anything that moves. if GMs implement different bg foods (+8 str etc) before using my stat points. And I haven't woed on v3 yet, need to see if 85 total vit will be enough. Make your build with +7 foods cause they wont put highest foods. Btw champ ready to woe, IN. Ethereal RO, Euphro, Ero v2. I only did woe se in StrongHold though. Champion is not hard to play in WoE bro. The stuff he has means nothing about his skills. It's easy to ask advices or copy the gears/build of someone else. Anyway, gears and build are fine. But you don't seem to have much experience in SE. Could you explain furthermore what could be your job in woe ?